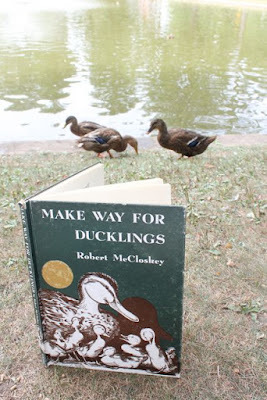 For years I have had copies of Robert McCloskey's book, Make Way for Ducklings on my bookshelf. First, I had a small paperback copy and then I upgraded to a large, full-size paperback. Then, I found an ex-library hardcover version which I later replaced with my current edition, a nice 1969 hardcover version. The strange thing was I never read the book despite always having a copy in my possession. It was a book I wanted in my library because I knew it was a significant book in the history of children's literature, but I never took the time to enjoy it. About a month ago, I thought of the book, pulled it off the shelf, sat down to read it for the first time, and loved it. I identified with the ambitious and brave Mrs. Mallard as she took her little ducklings for a stroll in the city. 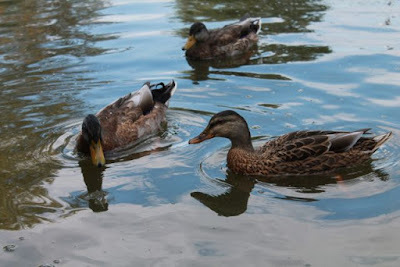 Readers of this blog know I love to stroll and try new things with "my ducklings" and just like Mrs. Mallard I get "an extra swing" in my waddle when people say to me "Well, now, ain't that nice!" when we are out and about. 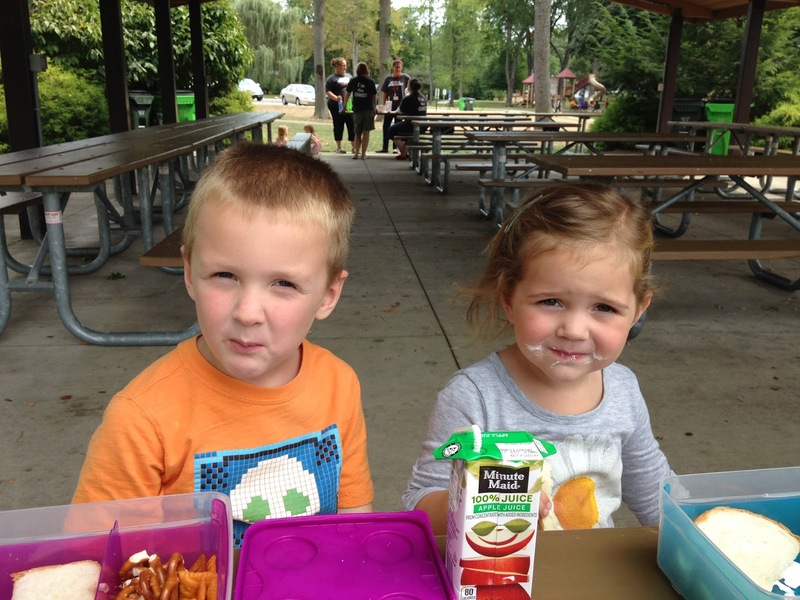 So, this week, I said to my youngest two children, just like Mrs. Mallard, "Come along, children. Follow Me," as we went on a surprise adventure with this classic book that will no longer sit on my bookshelf unread. Robert McCloskey wrote and illustrated eight books for children including Blueberries for Sal and Homer Price. He also illustrated an additional ten books for other authors including Journey Cake, Ho! written by Newbery Medalist and McCloskey's mother-in-law, Ruth Sawyer. Robert McCloskey was born in Hamilton, Ohio where they continue to celebrate him at the Heritage Hall Museum. The museum is home to many pieces of McCloskey's artwork, his harmonica, his artist box, and his two Caldecott Medals. Robert McCloskey was the first children's book artist to be awarded two Caldecott Medals; (1942) Make Way for Ducklings and (1958) Time of Wonder. After, Lentil came Make Way for Ducklings, a book about Mr. and Mrs. Mallard trying to find a new home to build a nest and raise their ducklings. McCloskey purchased real ducks, brought them to his apartment, let them swim in his bathtub to help him draw them more accurately for the book. 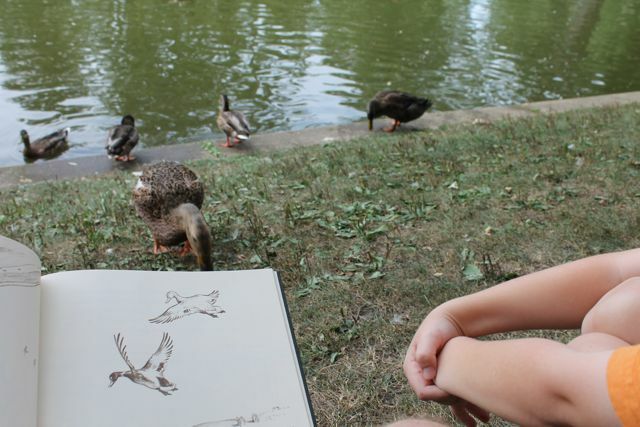 Legend has it that he gave the ducks wine to drink so they would slow down so he could draw them better. (Children's Book-a-Day Almanac). 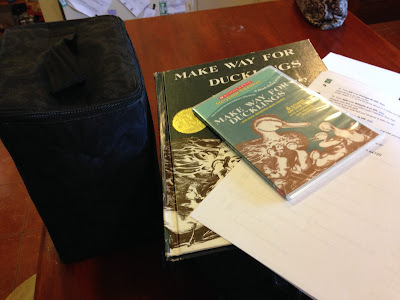 After reading Make Way for Ducklings that first time, I knew it would be the perfect book for my youngest two children. 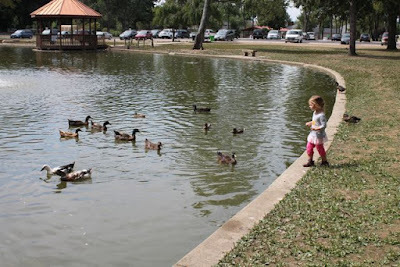 I thought of Price Park in North Canton, Ohio, a park my wife and I used to walk around during our college days. I remembered there always being lots of ducks in the pond. Once, my wife was frightened because so many ducks approached her and surrounded her legs. 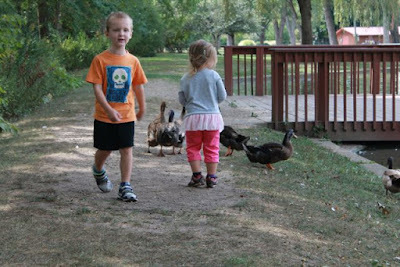 I thought my little ones would love seeing all the ducks. I just hoped ducks still visited the pond since I hadn't been to the park in many years. I packed a picnic lunch, the book, driving directions, and a Make Way For Ducklings DVD for the ride home. 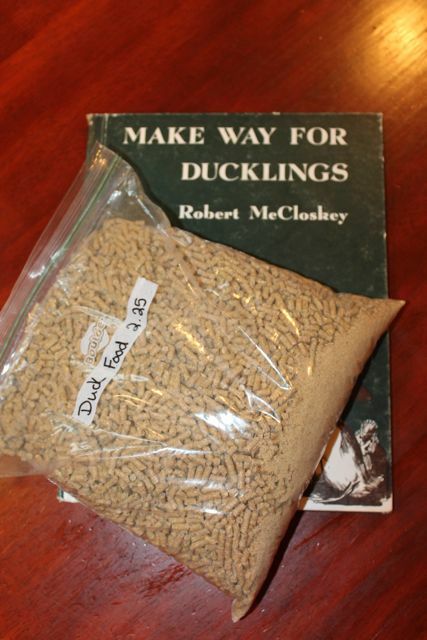 After picking my son up from half-day Kindergarten, we went to the local feed store to pick up some duck food. I opted for normal duck food instead of peanuts like Policeman Michael fed Mr. and Mrs. Mallard in the book. We arrived at Price Park and my children wanted to feed the ducks immediately. 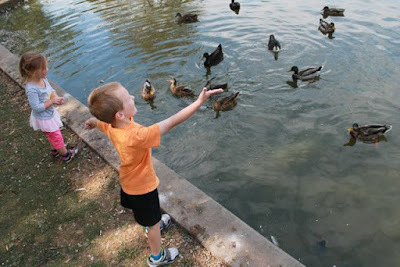 My son threw in handfuls of duck food. Then, he made it rain duck food! 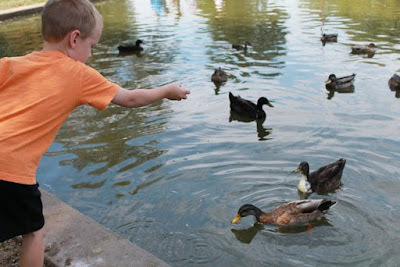 We talked about throwing one piece at the time because the ducks can't possibly eat all that food at once. Mr. and Mrs. Mallard were swimming in the pond. I wish I would have clicked a few more photos after this one, because shortly after this photo the ducks ran after my daughter scaring her. I am lucky she didn't run into the pond. She was that frightened (like mother, like daughter!). It didn't take long for her to start feeding the ducks again. 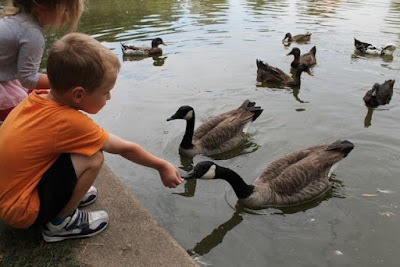 My son was excited that the Canada Goose would eat right out of his hand. We read Make Way for Ducklings right by the pond. Some of ducks came right up to us while we were reading. I think they liked the book, too! We finally ate our lunch around 1:45pm. 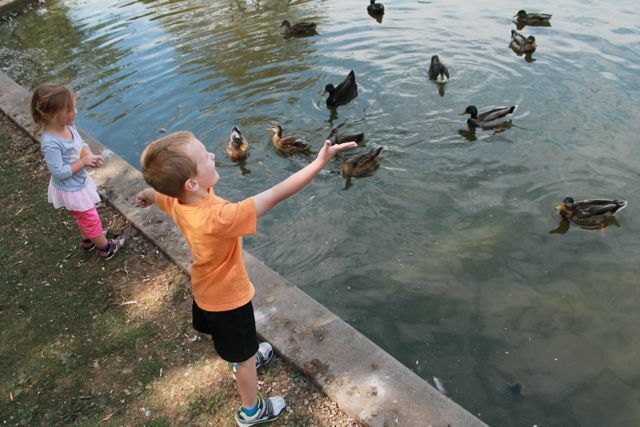 They had so much fun feeding the ducks for over an hour. I am glad my children followed along. This was another fun adventure.